When last we left our intrepid travelers, we had just endured a week with a Fiat 500 Abarth. We didn’t like it; it was loud, tiny and felt like you were driving atop a bowling ball. Sure, we got it, some people love the little Fiats… we just don’t belong to that crowd. Chrysler, which for the uniformed merged with Fiat back in 2009 and is now known as Fiat-Chrysler Automobiles or FCA, which sounds like some sort of healthcare supplement, does a great job with their vehicles. We recently had a week with a Chrysler 200 and loved it. The Abarth too was well built, but not enough that it swayed our opinion. Here’s a little lesson in the world of an auto reviewer (no extra charge). Now the way it works is this: the company that delivers vehicles to journalists calls in the morning to tell us what time they will be there and with what kind of car. For us that day is Monday, and it’s really like Christmas. After all we never know just what we will get; a Porsche, Lexus, Mercedes? On a recent Monday the call came. We would be getting a 2015 Fiat 500L…for two weeks, not one. And it would be the car we would be driving 600 miles from Florida to Charlotte North Carolina for the 2015 NASCAR Media Tour, an annual event that starts the racing season. We are always grateful to have the chance to try a new car, report on it to you dear reader. But somewhere in the background on this Monday we could hear a whisper (In Italian), Karma, man, karma. Boy were we in for a surprise. For starters the polarizing look of the 500L actually had us on the side, of “hey we kind of like this.” Inside there are differences to the Abarth as well. 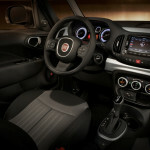 The interior is much roomier (the 500L is 27.7 inches longer and 6 inches wider than the city-sized 500) and the controls and layout seem a bit more pleasing then what we had crammed into the Abarth. The larger interior is meant to give more of a “cab-forward” feel and we did indeed like it. 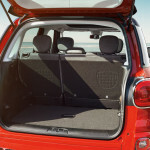 Fiat offers the 500L Pop, Easy, Trekking, and Lounge models. With the base level Pop you get AC, cruise control, and a tilt/telescopic steering with controls among other features you’d expect. 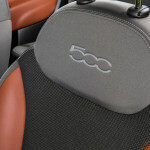 Six-speaker sound is also included, with the Uconnect 5.0 system that includes a 5.0-inch touch screen, hands-free calling, Bluetooth and a media hub with USB and aux-in ports. The Easy level replaces the steel wheels in the Pop version with 16-inch alloy ones and gets you tinted rear windows, a nicely placed center console and armrest and 520 watt sounds system and leather wrapped steering wheel and shift knob. The add ons on the Trekker include a slew of appearance extras such as unique front and rear fascias, neat looking flared wheel openings and trim along with 17-inch wheels . The top of the line Lounge model gets you power heated leather front seats, driver lumbar adjustment, split-folding rear seatbacks with fore-aft adjustment (and recline/tumble), fog lamps, and a dual-zone climate control system. We had that on our Trekker as options along with a Uconnect 6.5 system with a larger 6.5-inch screen, an SD card slot, text-message readback, navigation Satellite radio, the Beats By Dre sound system, which includes six speakers, a subwoofer, an eight-channel amp, and Beats By Dre-specific audio processing. 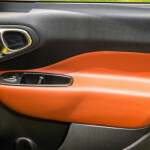 Finally there was a rear view camera and parking sensors (Fiat offers little in the way of individual options instead they are bundles called “Collections”). The view from the driver’s seat is panoramic, with smaller windows framing the front windshield and giving a very pleasing view. Helping this is the large dual-pane glass sunroof above. In fact, in all there is 20.7 sq. feet of glass. The rear seating was somewhat surprising as the rear seats are positioned even higher than the fronts which we found to be quite clever. 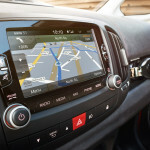 Changes for 2015 include a new six-speed automatic transmission, an updated instrument cluster and some new color combinations. 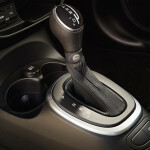 New for 2015 is an automatic transmission for the more powerful 500 Turbo and Abarth. 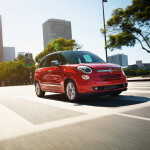 All 500L models are powered by a 1.4-liter MultiAir Turbo four-cylinder rated at 160 horsepower and 184 pound-feet of torque. That’s the same engine found in the smaller 500, but doesn’t really seem underpowered in this heavier model. The increase in size made all the difference in the world, at least to us. This is a Fiat 500 we could live with. Of course, we still had over 600 miles of driving ahead of us…that would be the real test. We were in for more surprises. The 500 is known as a city vehicle certainly not something you could ever imagine on a long highway trip. 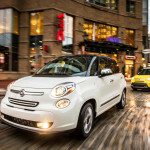 On the road around town the 500L is fun to drive, the MacPherson front-suspension design has exceptional rigidity for increased cornering performance and reduced weight according to Fiat. There’s also a “split” type shock absorber mounting that transmits road vibrations to the body through two different routes that gives improved acoustics and better efficiency of the shock absorber. 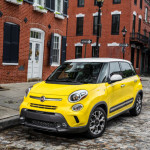 Fiat points out the for North America the 500L features Koni frequency selective damping (FSD) front strut and rear shock absorbers to deliver improved road-holding and handling characteristics. In addition, the Koni FSD system actively filters out high-frequency suspension inputs from uneven road surfaces and adjusts for comfort and smoothness while maintaining excellent ride control. During our first days driving the city streets we found a car that was not only fun, but could hold its own in heavy traffic during a commute. However, our road trip loomed and we wondered just how our 500L designed for city driving would fare on the open highway. As it turned out it fared just fine. Sure the 1.4 liter took a wee bit longer to get up to highway speed, but once there it did just fine. The ride was smooth, the interior quiet and the outstanding panoramic view was great on the open road. The other surprise was the fuel mileage. The 500L is rated at 22 mpg city, 25 highway and 30 combined with the new six-speed, but we think someone might have been wrong on the calculations as we got more like 34 on the highway, which was great. What was not so great for highway driving was the 13.2-gallon fuel tank which precipitated the need for as many fuel stops as always. This wasn’t too big a bother though as gas was below $2 a gallon and a fill up was just over $20. At the end of the two weeks we had to say we were impressed. 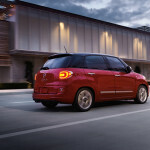 The Fiat 500L has certainly changed our mind. There’s a lot of room, a lot of features, and a great view. 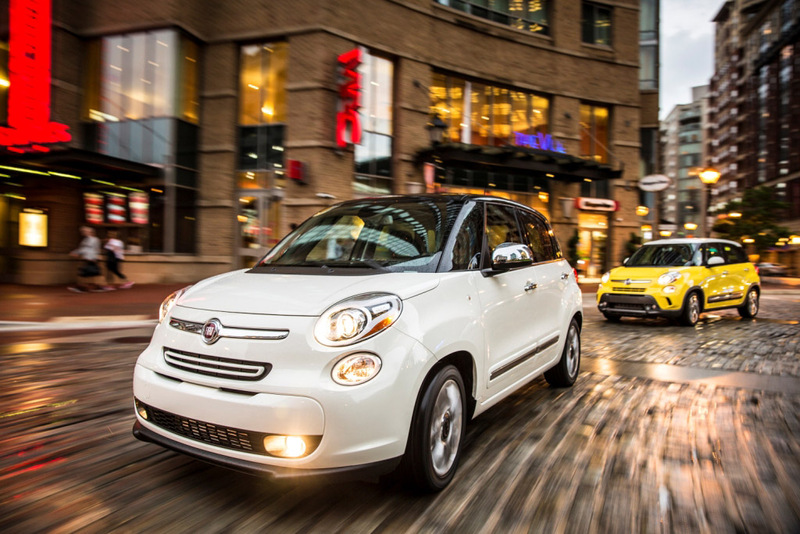 The 500L is something that anyone looking for a fun vehicle that’s a little different needs to try. Whether it’s driven on city roads, where it was designed to be, or an occasional jaunt on the open highway, the 500L impressed us, and it will impress you too. It doesn’t mean we will jump back in an Abarth and actually like it now, but Okay, ora abbiamo capito , buon lavoro .